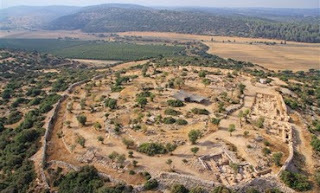 King David's Palace Discovered? No, probably not. The internet has been alive the last few days with claims that King David's Palace has been discovered (see the Jerusalem Post). Now, with that type of headline many readers are going to associate the discovery with Jerusalem and assume, unless they read the article, that somewhere in the ancient city of Jerusalem archaeologists have finally discovered the home of King David the slayer of Goliath. The reality, however, is that while the discovery is important, it is not located in Jerusalem and it is not necessarily related to David and it certainly doesn't prove that David killed Goliath. According to the IAA press release, the discovery was made at a place called Khirbet Qeiyafa. This city is located 20 miles southwest of Jerusalem in the Shephelah region which consists of several narrow valleys that served as an important geographical buffer between the Judean mountains, where Jerusalem is located, and the coastal plain where a major highway between Egypt and Assyria/Babylon was located. According to the archaeologists, the foundation stones of what is the largest known building from the tenth century BCE were discovered at this site. Here is some of what the IAA report says. 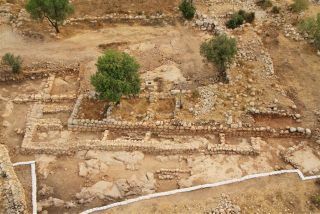 The palace and storerooms are evidence of state sponsored construction and an administrative organization during King David’s reign. “This is unequivocal evidence of a kingdom’s existence, which knew to establish administrative centers at strategic points”, . The presence of large buildings certainly demonstrates some sort of organized government that is making use of its strategic positions. And the dating of the ruins does suggest that the time frame fits nicely with the period in which David and Solomon's reigns are often placed. But without more specific evidence or some graffiti saying "King David was here," we cannot say much more. See the full IAA press release here. Last year my wife and I went on a tour of Turkey. While we were there we visited the ancient Roman city Aphrodisias where I was first introduced to a former slave named Zoilos. 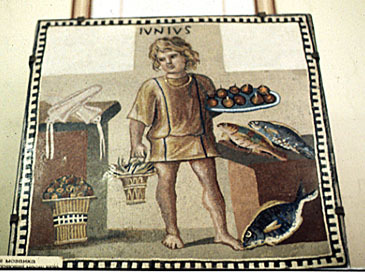 I posted a blog about our visit (here) with some thoughts on the similarities and differences between Zoilos and Onesimus. Last month I published an article in Biblical Archaeology Review based on that blog post. An edited version is now available on Bible History Daily. Incidentally, my friend and colleague, Tim Gombis, is beginning a series on Philemon & Onesimus over on his blog Faith Improvised. Tim is going to argue that Philemon and Onesimus were actual brothers. Tim and I have talked about this in private and he knows that I disagree with him. But I look forward to hearing his thoughts afresh now that he has had time to put them in the form of a research paper. Perhaps he will change my mind.